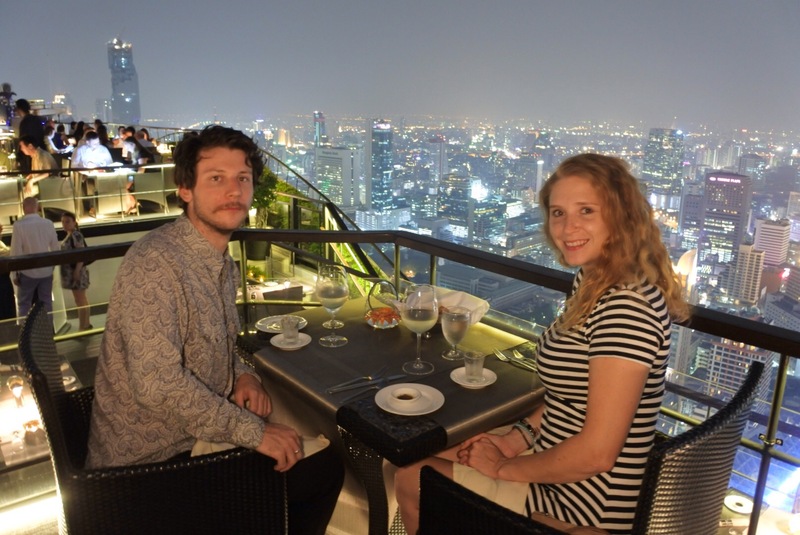 Day one in Bangkok and after a whole day of trudging the streets in humid 32 degree heat, we were ready for a relaxing dinner at Vertigo, an al fresco dining experience situated on the top of the Banyan Tree hotel in Bangkok’s sparkling Sathon district. Known for it’s gridlocked streets, Bangkok can be a pain to travel around by taxi. Last night was no exception and as a result we were slightly late. Feeling mildly stressed as we wandered through the hotel reception towards the lifts, all feeling left my body as we ascended at rapid pace up to the 59th floor. Once we arrived, we were ushered up two more floors to the rooftop. Neither of us were prepared for what we were about to see and as we stepped out onto the deck, loud gasps escaped from both of our mouths as we looked over Bangkok’s glittering skyline. We were at Vertigo to sample the four course menu with matching wines. After checking in, we were led up another flight of stairs to our table at the edge of the deck with a perfect view of the city. As we pulled up our chairs, mouths open, we both agreed that we were about to embark on one of the most magical dining experiences that we had ever had. After a quick explanation of the menu, we were offered water and provided with a basket full of freshly baked bread and dipping oil with balsamic vinegar. It didn’t take us long to choose our dishes and the attentive wait staff set to work on making our first meal in Bangkok a memorable one. I started off with Spicy Abi Tuna Ceviche with Guacamole, Corriander and Lemon Caviar, which was followed by Slow Roasted Royal Project Corn Soup with Coriander and Spiced Crab Salad. For main I opted for the Australian Pasture Fed Tournedos Steaks with Bernaise, Mushrooms, Watercress Salad and Roasted Vine Tomatoes. I ended with an Eaton Mess, which with it’s lovely light cream, was a perfect way to end the meal. We also chose to have matching wines, which allowed us to enjoy a delicious Sauvignon Blanc from Chile, Shiraz from Australia and a sparkling dessert wine from Italy. Sadly by the end of the meal jet lag had reared it’s ugly head and as a result we weren’t able to stick around to enjoy a drink at Moon Bar, which is situated adjacent to Vertigo restaurant. Having seen a few intriguing cocktails being delivered to other tables during our dinner, it was a little upsetting, but spirits weren’t dampened as we had just enjoyed a couple of hours on a spectacular rooftop that we wouldn’t be forgetting in a hurry. Four course meal with matching wines cost around £100 per person.